Info "A mummy?! Pull on the bandage to reveal what’s under the wrapping!" It's a Wrap is one of Orbulon's Microgames in WarioWare: Smooth Moves. The name is a pun on "It's a trap! ", which is Admiral Ackbar's line in Return of the Jedi. 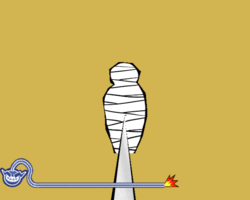 The player must unwrap the mummy shaking the Wii Remote and Nunchuk side to side. When it's unwrapped various people can be underneath such as aliens, girls, and sumo wrestlers. 1st level difficulty: Little wrapping. The person is a girl. 2nd level difficulty: More wrapping. The person is an alien. 3rd level difficulty: A lot of wrapping. The person is a sumo wrestler. This page was last edited on August 19, 2018, at 20:18.